Hello Everyone! How you doing? Hope you all are fine and doing good. Every blogger was in contact with the Google’s blogspot network. And it might be the case that you have started blogging with Blogspot. And after getting a remarkable position in blogging; you might want to shift your blog to more powerful tool like wordpress which is solely designed for Blogging. So today here I’m sharing a trick with which you can completely switch to wordpress or any other blogging platform without even loosing your old visitors. Considering that you have domain name and hosting with you and you have complete control over domain(at-least) and hosting; let's see steps of migration. You have to install wordpress to your hosting and confirm that it is properly running. Just confirm it running; leave the theming and all other setting stuff for later. Just empty wordpress with the sample post, page and comments. Though it is not necessary to do it rite now; You can also do it later after completing all the steps of this tutorial. 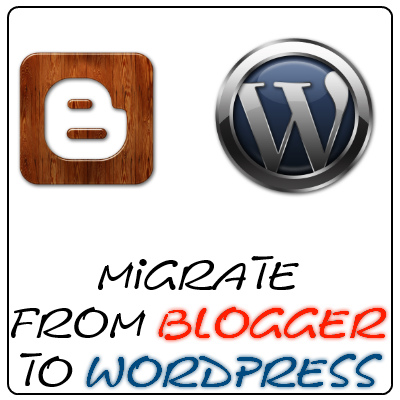 Now install the Blogger blog importer plugin. With this we will import all our posts and labels to our wordpress installation. Now open up the new tab in same browser window and login to your blogger account; and the logged in account must have the admin privilages to the target blog. Now run the importer plugin and import the posts and categories to wordpress. And yes just add the authors to wordpress similar to you blogger editors! Because after import, it will ask to map the different post editors to the wordpress editors. After successful import of post just install the categories to labels convertor. As the import in previous step adds all the labels as categories. So to convert them to labels, you can do so. If not SKIP this step. Now we will make our blog to be accessed by our new domain. For this just go to general settings of your blogger blog. And now choose the blog address to custom address and add your domain. Basically this step and next step are collective so you have to perform both steps combined. In this step you have to update DNS records of your domain so that on request it can point to your blogspot blog. For this there are some A and TXT entries to be added to your domain name and one additional CNAME entry to convert yourdomain.com to www.yourdomain.com. After updating these DNS records just wait for it be spread on global servers. For new domains the waiting time is minimum and can range from 2 hours to 6 hours. But for domains older than a week you have to wait for 24 to 48 hours. And after updating the DNS records just keep trying to add your custom domain to blogger blog. This step is necessary because you want your.visitors to reach your new blog from your old blogspot URL. Though blogger shoes a redirection message to user that the blog domain has change from that.blogspot.com to www.yourdomain.com and redirect to new domain. Once the domain is is added to blogspot and you are able to access your blogspot blog from your custom domain and also your old blogspot URL is now redirecting to your custom domain; now you can change back your Domain’s DNS Settings so that it can point to your wordpress installed hosting. For that you have to update the NS records and remove the Google’s A, CNAME and TXT records. And to get these settings in effect completely; wait again for 24 to 48 hours. Now after getting all the visitors from both the URLs; next step you have to perform is.to update the permalink structure of blog posts so that it resembles with blogspot. What its gonna do? Its really very helpful to let your visitors know about your new blog URL address and then they are automatically redirected to the respective post that they are trying to visit. And thats it. Now you are up.with your new domain and you will get all of your regular visitors. This post and trick is first time appearing on Internet on Time to Hack. And its 100% genuine because the blog Time to Hack has gone through this procedure and is receiving all the benefits of this trick.